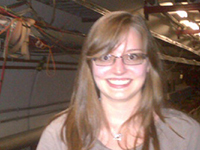 Jackie is a third year UC Berkeley graduate student in high energy physics, working on the ATLAS experiment. She is an active member of the Society of Women in Physical Sciences (SWPS). 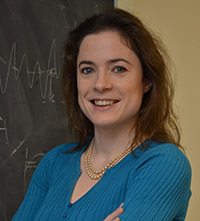 Katherine Copic is a staff scientist at Lawrence Berkeley National Laboratory(LBNL) , working with the ATLAS collaboration and the Particle Data Group. She worked previously as an ATLAS postdoc at Columbia University and a Ph.D. student at the University of Michigan on the CDF experiment at Fermilab. She has participated in mentoring since her undergraduate days at Cornell University, working with the SPS there and at Michigan, giving talks to undergrads and grad students as a postdoc, and most recently participating in the bay area as a mentor for Technovation, a twelve-week program that aims to get high school girls hands-on experience with technology. As part of the IceCube collaboration, Freija Descamps received her doctorate in Physics at the University of Ghent, Belgium in 2009. During her 5 years with IceCube she participated in many outreach projects and was part of the organizing team of the IceCube collaboration meeting in October 2007 (held in Ghent). She is now a postdoctoral researcher at the Lawrence Berkeley National Lab and is a mentor in the Society of Women in the Physical Sciences' (SWPS) mentoring program. 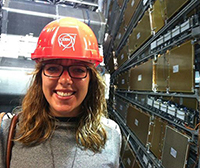 Emily graduated from the University of Minnesota – Twin Cities and is currently a first year graduate student in the physics department working on the ATLAS experiment. As an undergraduate, she was dedicated to promoting women in physics and pushed her university to begin participating in the Midwest CUWiP. She is looking forward to continuing to encourage women studying physics by becoming involved with the Society of Women in Physical Sciences. Luisa Fernandez-Hansen is a senior physicist at Lawrence Livermore National Laboratory (LLNL) where she has worked for the last forty years. She got her Ph.D. in experimental Nuclear Physics from the University of California in Berkely and her B. Sc. in Mathematics in her native country of Chile. Dr. Hansen was chosen a Fellow of the American Nuclear Society in 1989. 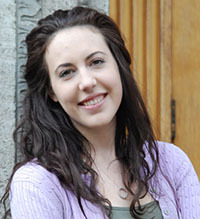 One of her main interests is to increase the participation of women in Science ad Engineering. She has been a member of the Committee on the Status of Women in Physics (1981-1983) and also a member of the Committee on International Freedom of Scientists of the American Physical Society. She has had an active participation in Expand Your Horizons in Math and Science and Career's Day annual conferences, as an organizer, workshop leader and presenter. Beate is an Associate Professor at U. C. Berkeley and Research Scientist at LBNL. She did her PhD in Hamburg on the H1 experiment at the HERA electron-proton collider. She has worked on the CDF experiment at the Tevatron, at Fermilab in Chicago, and in January 2007 joined the ATLAS experiment at the Large Hadron Collider (LHC) CERN in Geneva/Switzerland. Beate is currently a Deputy Spokesperson of the ATLAS Collaboration. She was an invited speaker at the 2012 CUWiP conference at SLAC, and has given numerous public lectures on the Higgs Boson. 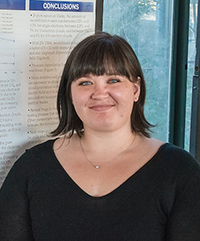 Tova completed her undergraduate degree at Harvard University, and is now a third year graduate student in the Berkeley physics department working on the ATLAS experiment at the LHC. She has been part of the mentoring programs for both the Society of Women in Physical Sciences (SWPS) and Compass. 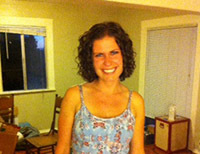 Kate is a third year graduate student in the Berkeley physics department working on the SNO+ experiment. She graduated from the University of Chicago, where she founded the U. Chicago Society of Women in Physics in her third year. She continues her commitment to underrepresented groups in the physical sciences as the Head Coordinator for the Society of Women in Physical Sciences (SWPS) at Berkeley. She is also actively involved in the Compass Project's Mentoring Program, and is engaged in planning a collaborative series of mentoring events between the two programs. Megan is University of Maine physics student and an undergraduate research intern at Lawrence Berkeley National Laboratory (LBNL). She is currently researching directional dark matter detection with the NEXT experiment. Megan is passionate about the topic of women in science, and is excited to be able to help plan this conference. Mayra grew up in Mexico and came to the United States as an adult. She learned English here and graduated in Astrophysics from San Francisco State University. She is passionate about dark matter research and advancing the education of disadvantaged youth. Mayra works on directional dark matter detection as a research assistant at Lawrence Berkeley National Laboratory. Kelsey grew up in Colorado before attending a junior college in San Diego and later transferring to University of California Berkeley. At Berkeley she was able to follow her interest in particle physics by joining the Directional Dark Matter Detection group at Lawrence Berkeley National Lab (LBNL). 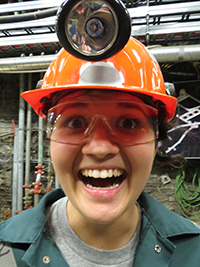 She is currently working for the LBNL branch of the Long Baseline Neutrino Experiment and hopes to continue work in particle physics in graduate school. Gabriel completed her degrees in the UK before moving to the US for a post-doctoral position at the University of Pennsylvania. 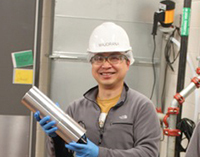 Gabriel started a junior faculty appointment at U. C. Berkeley in January 2012, with a 50% Faculty Staff appointment at LBNL. Gabriel has given talks on her research to elementary school students in Philadelphia, and to undergraduates as part of the Compass Project. 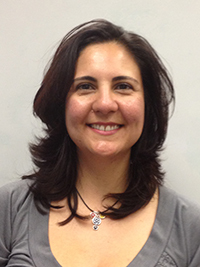 Gabriel is the current faculty mentor to the U. C. Berkeley SWPS program. Alan is a member of the APS Committee on Education (term from 2012-14). He is the organizer of the annual LBNL Nuclear Science Day for Girl Scouts and Boy Scouts, and a member of the Advisory Council of Community Resources for Science, a non-profit group that supports science teaching at public schools in the Bay Area. Alan also chairs the Mentoring Committee for grad students and postdocs of the Majorana Collaboration. Marjorie Shapiro received her PhD in Physics from UC Berkeley in 1984. She joined the Harvard faculty in 1987 and returned to Berkeley in 1990,where she served as Department Chair from 2004-2007. She is a Fellow of the American Physical Society. In 2011, Shapiro served as a scientific mentor in the State Department sponsored TechWomen program. All of the Berkeley CUWiP organizers can be reached at cuwipcontact[AT]lists[DOT]lbl[DOT]gov. You can address your question to one of the organizers specifically, or ask a general question.